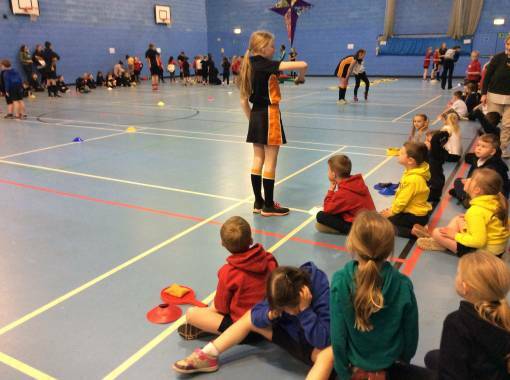 Two hundred and twenty Year 1 children participated in the BGN Family multi-skills festivals held at Blessed George Napier Catholic School on Thursday 28th March. The two festivals involved Bishop Loveday, Cropredy, St. John’s, St. Joseph’s and William Morris primary schools attending the morning event and Hardwick and Orchard Fields primary schools taking part in the afternoon festival. Teams took part in various relay and skill based activities in a circuit. These included rugby, tennis, obstacle relay, bean bag relay, shuttle run, target throw, dribbling and standing long jump. The activities were confidently planned and delivered by twelve student leaders from Blessed George Napier and supported by twenty-four student leaders from Bishop Loveday, Hardwick and Orchard Fields primary schools. All student leaders are part of the BGN Family Key Stage 2-3 Leadership Academy and received training for this event on the previous week in which Year 7 BGN student leaders acted as mentors for the Year 5 student leaders. During the festival, the Spirit of the Games value ‘Team work’ was a key focus area. One member from each team was presented with a special certificate to recognise their positive attitude throughout the festival. Congratulations to all children, student leaders, teachers and additional adults who all contributed to two very fun and enjoyable festivals.